I have always been interested in Crown Prince Rupprecht, whose life seems almost like a storybook tragedy. Two of his children died in childhood, one died shortly after his thirteenth birthday. His first wife died in 1912, and his second wife, along with their five children, were imprisoned in a concentration camp during WW2. However this seems to be the extent of the information I can locate on Crown Prince Rupprecht. Does anyone know the conditions of the deaths for the three children of his first marriage, as well as the fates of his second wife and five children? Any help would be greatly appreciated. Oh--finally an Antonia Luxemburg/Marie Gabrielle thread! (Those were the 2 wives) I've always been interested in both. Rupprecht, Crown Prince of Bavaria (Munich 18 May 1869- Leutstetten 2 Aug 1955) was the son of Ludwig III (who was regent for years since his elder brother was insane until he finally assumed the throne in 1913 until the German Revolution in 1918) and Archducess Maria Therese of Austria. younger brother Duke Franz Joseph in Bavaria. Marie Gabrielle died in Sorrento, Italy, where she had gone for her health with Princess Friedrich of Hohenzollern. 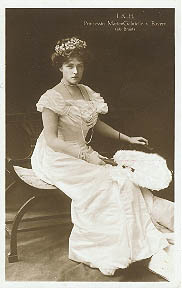 Her husband Prince Rupprecht did not accompany her since he was occupied with his military duties. Rupprecht secondly married Princess Antonia of Luxemburg in 1921 when he was 53 and she was 22. Antonia (1899-1954) was one of the 6 beautiful sisters who included Grand Duchess Marie Adelaide (who abdicated and became a nun) Grand Duchess Charlotte and Princesses Hilda, Elizabeth and Sophie. They had Heinrich (1922-1958); Irmingard (again) (b.1923); Editha (b.1924), Hilda (1926-2002); Gabriele (b.1927) and Sophie (b.1935). Antonia was imprisoned, along with several of her children, in a concentration camp on order of the Nazis. This was because Rupprecht (still a tremendously popular figure in Bavaria—a Nazi stronghold) was virulently anti-Nazi and caused a great deal of trouble. He was able to escape to Switzerland but his family was caught. Antonia was apparently never the same after this and refused to ever return to Germany after she was freed. I don’t know how this affected the marriage since Rupprecht still primarily resided in Bavaria I believe. I think Antonia preferred Switzerland. Her health was broken by her ordeal and she died at age 55. MG and Antonia were cousins since both their mothers were Portugese Infantas. Florence. Prince Albrecht spent most of the war years in Hungary. Antonia and their children joined Rupprecht in Italy. From what I can understand, in 1939, the Crown Prince and Princess and their children, went to Rome to attend Vittorio Emanueles 70th birthday celebrations. Once there, Hitler denied them re-entry to Germany. I'm a bit hazy on this exact period though. After the Stauffenberg plot to assassinate Hitler in 1944, the Reich moved against its enemies. They attempted to arrest Rupprecht (who'd been under Gestapo observation for years) but he was able to elude them. For some reason, perhaps the health of one of the children?, the couple were separated and this allowed Antonia to remain within their reach. In August the Gestapo arrested Antonia and her four youngest daughters. They were charged with being involved in the von Stauffenberg plot to assassinate Hitler. In October they were ordered sent back to Germany. Rupprecht and MG's son Albrecht was also arrested and interned. The princesses and Albrecht were sent to Oranienburg-Sachsenhausen but Antonia, being ill with typhus at the time, was left behind with Irmingard. The princesses, including Irmingard, Albrecht and his family were eventually transferred to Dachau in April 1945 where they were shortly liberated by the US Army. For awhile Antonia 's whereabouts couldn't be assertained until finally her sister GDss Charlotte of Luxemburg located her after the war in the Jena prison hospital. She had been subjected to daily injections of morphine and her health broken. She had been hard to locate since she, like Princess Mafalda of Hesse, had been imprisoned under a false name. Rupprecht meanwhile had been forced to remain in hiding in Italy. Finally he was 'liberated' by the British who sent him back to Leutsetten in November. I think he might have faced some brief questioning until it was ascertained that he was in fact anti-Nazi unlike many German royals and nobility. Wow, thank you tons GDElla Am I right in thinking that some of Rupprecht's descendents are in the Jacobite line of succession? I think it's his grandson, or maybe great-grandson who is the current "king?" as always, a mountain of great information. thanks Grandduchess! Regarding the imprisonment of royals in concentration camps, were any actually executed? 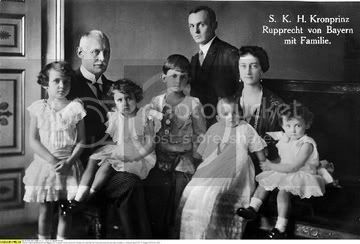 Stauffenberg was royalty, too, correct? Does he have offspring currently in royal circles? It is somewhat interesting that his failed plot in the late stages of the war/regime was the trigger point for the Nazis to come down on "their enemies". Curious why they waited so long since they were well known for not being patient or understanding for the previous 11 years. This was because Rupprecht (still a tremendously popular figure in Bavaria—a Nazi stronghold) was virulently anti-Nazi and caused a great deal of trouble. Yeah, we Bavarians are still devoted to Rupprecht. Two months ago (because of his deathday on August 2nd), there was a great article about him in the biggest German nationwide newspaper, "Süddeutsche Zeitung". I´m also very interested in Marie Gabrielle and Antonia, his wifes. Would love to discuss them more here on the board!! Wonderfol pictures! As I have read, you are also interested in Rupprecht´s wifes? Yes I am. I don't know a lot past the basics but am trying to find out more. I just ordered a book (in German) on Marie Gabrielle. Oh, which one? The one by Huber? I think so--I won it on ebay so I'll have to check the author. It´s actually the only book around about Marie Gabrielle (but there´s a lot about her in all Rupprecht books). It´s a very nice book with lots of (unpublished) photos and it´s written in the Old German way of writting. Actually it´s Marie Gabrielle´s birthday today! She was born on October 9th 1878 in Tegernsee, Bavaria. One portrait of Crown Prince Ruprecht!